Sun blank again | Watts Up With That? Just two days after sunspot 983 was reported, it has now disappeared. They just aren’t sticking around like they used to. This is yet another indication of the bottomed out solar minima we are in. It will be very interesting to see if the cycle 24 predictions by Hathway at NASA for an even stronger cycle will materialize. 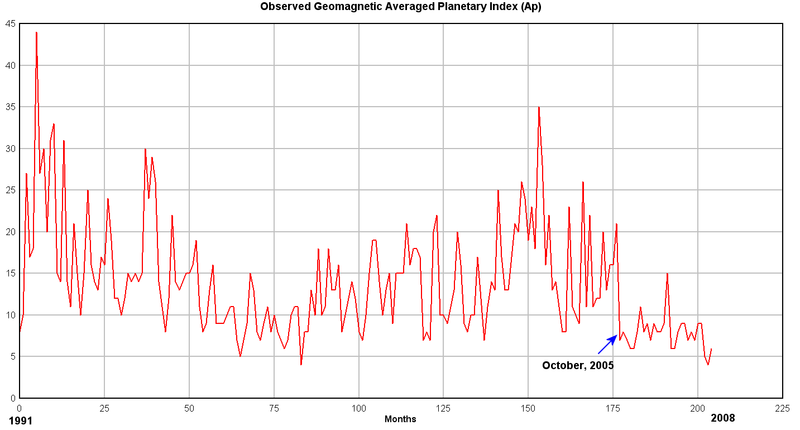 What is most interesting about the Geomagnetic Average Planetary Index graph above is what happened around October 2005. 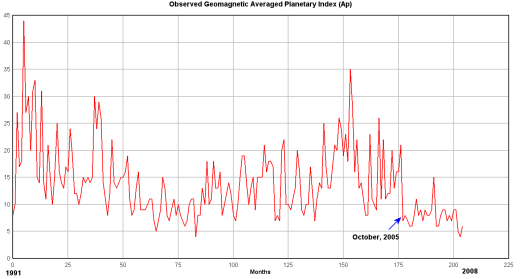 Notice the sharp drop in the magnetic index and the continuance at low levels. […] despite the panel’s division on the Sun cycle’s intensity, all members have a high confidence that the season will begin in March 2008. We shall soon see if they are correct, March starts this Saturday. Nature will truly be the final arbiter of this argument. I thought you might find this chart interesting. 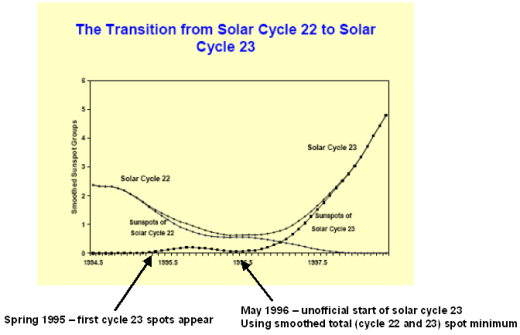 Since sunspot cycles overlap and there is no clear start/stop, the “start” of the new solar cycle is usually defined as the smoothed sunspot minimum between cycles (as opposed to the appearance of the first reversed-polarity spot). Although different definitions are sometimes used, this seems to be the most common and accepted variation. I’m unsure of the cycle start date definition used by Douglas Biesecker, but if it is the commonly accepted definition, he will be way off. It will be interesting to see if they claim the appearance of a few reversed cycle sunspots count as a “start”. If so, then cycle 23 actually started back in March 1995 and is 13 years old. February 28, 2008 in Science. Is the duration of individual sunspots available as readily plotable data somewhere? We have had an unusually cool winter here in N E Alabama. It has not been record breaking but much cooler than the last few years at least since “99” and we have had a little snow thus far the first in about 8 years. We also have another snow event possible next week so I wonder if the PDO and the La Nina and minimum sun spot activity are taking effect. I am afraid that a cooling trend of any signifiance would be a terrible thing possibly causing food shortages. I would think that a slight warming trend would be much easier to cope with. I don’t think the warming we have experienced was any crisis at all but there is the possibility that any cooling of significance might be catacylismic. The reduction of arable land for crop production and shorter growing seasons could lead to wide spread malnutrition and disease. I’m also curious to see how a significant change in sun intensity changes the status of photosynthetic organisms, in addition to the heat. The brightness and type of rays permeating the atmosphere are important too. This should perhaps be a good opportunity to assess the suns impact on cloudiness on earth. I couldn’t find current data on cloudiness over high seas (which is the most interesting part as Svensmarks claim is that the modulation of cloud seeds by cosmic rays in effect only matter where there is lots of moist and little aerosols, i.e. over the big oceans). Can anyone help with a link to such data, my googling skills are apparently not enough. that claims to have discovered a negative feedback from clouds over anomalious warm oceans. I have never heard of it, and it was published in 1995! The way I read this ocean currents upwelling warm waters actually change the radiative budget on earth. Which perhaps lends creedence to the oceanographers who claim that climatologists are often to narrow minded. 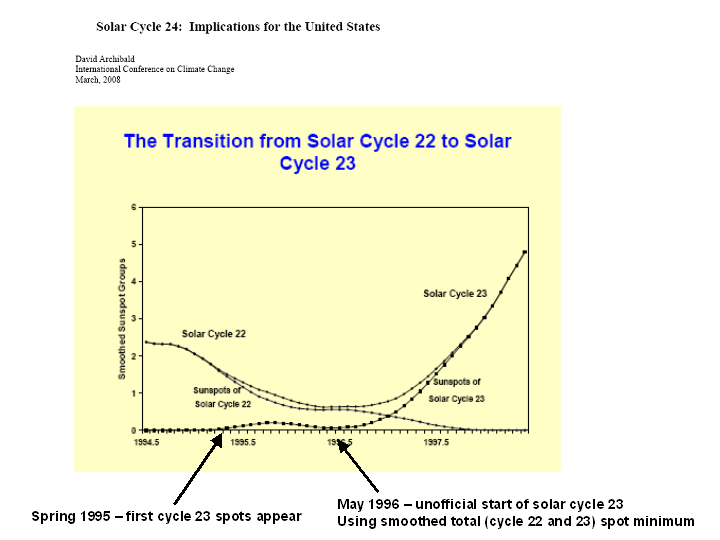 If the start of cycle 24 goes as 23, and the first sun spot of cycle 24 was seen a few weeks ago, then cycle 24 won’t “start” for another year. Should the sun go dormant, then there’d plenty to worry about – as we all know that cold periods in history have always wreaked far more havoc on weather, agriculture and society than warm optimums have. But, being an AGW scoffer, I confess I will not be able to contain my glee (Schadenfreude!) should the climate indeed turn colder. I have a list of names, A-Z, of alarmists who are going to get multiple earfuls from me when their bogus theory crumbles and the climate gets colder. Of course I don’t want a colder world because of the hardship it will bring to humanity and nature. But my desire to prove these know-it-better alarmists, charlatans and Al Gore wrong, and to really rub their smug faces in it, is 10 times greater. Think of the field day we’ll have smoking out these crackpots in droves! Yes Matt…we live in interesting times. So Mr(s). Sun…take your sweet time. The worst thing we could do is let these climate bozos off the hook. Humiliation and embarassment, and the lessons learned from them, are part of healthy growing up. Anthony, your blog never ceases to amaze and fascinate me. Now if only you could teach me some math and physics and refresh my memory on the statistics I learned back in 1966. But, then, we didn’t have Excel back then — heck we didn’t even have pocket calculators. We had a study group that met almost every night in the library of my fraternity house to work on statistics problems. Only one guy had (and knew how to use) a slide rule, and if he was otherwise occupied, we figured square roots long hand. I’m sure some of your older readers can relate. What’s funny is that I use Excel every day for accounting journals, and even for some columnar applications like a purchase order log. And I knew that you could create graphs and charts with it; it’s just not something I’ve ever had the occasion to do. I may have to take an advanced Excel course at our local regional campus just so I can follow along with some of your more accomplished readers. Or maybe I could get Kristen Byrnes to tutor me, heh. One of the most interesting things I find about this whole issue of climate change is that it’s not happening in a vacuum. Time keeps marching on, and things happen that either prove certain people right or wrong. 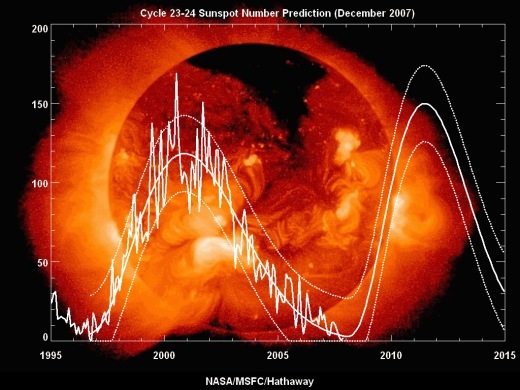 This solar cycle (or lack thereof) is a prime example. The more questions we answer, the more new questions emerge, which, I believe, is the way science is supposed to work. We already have 2 decades under our belt since this whole GW thing got rolling, and it’s already been a couple years since Al Gore said we’ve only got 10 years left to take meaningful action or we’re all doomed. If the next 8 years go as fast as the last 8, it won’t be long before his statement will be tossed on the ash heap of history as yet another hysterically ignorant statement from someone who didn’t know what he was talking about, but who, unfortunately, was able to affect the waste of millions or, perhaps, billions of dollars, much of which has gone into his own pocket. As Bill in Vigo says; “just my 2 cents. Bill in Vigo – Remember last year that winter hung on a little longer, we had a winter storm on Easter that severely damaged some of Kansas and Oklahoma’s wheat crop – well, today wheat is $11 (normally $4.5) a bushel and in short supply relative to what is normal. That was the result of just a small amount of unusual winter weather. If the priests of the global warming cult really cared about humanity, they would be talking about the possibility of global cooling. I don’t believe I’ve seen current TSI values (As of Aug-07) Compared to TSI Values of the Maunder Minimum. PMOD and ACRIM Data are Below the Maunder Minimum Values of Lean2000 (without Background) and Leif2007. PMOD is significantly lower. When all this shakes out, it’ll be interesting what this does to Solar Climate Sensitivity estimates. I with you on sunspot 983. I don’t think it would have been counted in past records. It would not have been noted. Even with modern ‘scopes you could barely recognise it as a spot. REPLY: And, with a cloudy day or two back then, it would have been missed for sure with such a short lifespan. Next time one of these small spots occurs, maybe somebody can go try to resolve it with a small dime-store telescope and a piece of paper for projection? or maybe the pinhole method? It would be interesting to see if they show up. One way is to compare the number of spotless days to other cycles. If you correlate that number to other cycles you may be able to figure it out. It gives you a Rmax of about 62 like SC15 and SC13. I think it maybe a little higher. There is also the chance of a Grant Minima. What are the acronyms you use and the source for the data you presented? OT~ I am surprised one ‘john cross’ has not come by to dispute your figures on the various temperature charts, Anthony. I do have a question related to this thread: I had read elsewhere the claim that the sun is already Two years past the point of the new cycle beginning. I am going to take it partially as that there is a delay from the first burst of new sunspots, as you have charted above… but they must be using somewhat different criteria for that assumption? The differences are discussed at both sites. Max D. I do remember the late (Easter) freeze here in Alabama. We lost most of the fruit crop from the north 1/2 of the state. and then the drought went into the extreme phase and all the crops were lost to the tune of less than 1/3 of expected production which included our winter wheat crop. Yes I agree just a little cooling isn’t a good thing. science, or truth, and most certainly not about what is good for humanity. The AGW?AGCC propaganda machine will continue on, regardless of what the science says. That’s the irony, BC. An unanticipated long term cool-off is going to be disastrous, and not just for the poor and powerless(I like that one) of the world. Say what you will (and believe me, I have!) about Hawkins et al. That book “Seven Tomorrows” is still knocking around up there in me noggin’ …. I looked up Seven Tomorrows and the scenario name is actually “The Beginnings of Sorrow” (quite Biblical!). In that scenario, there is worsening climate and mass infrastructure failures. After a few years, steam locomotives are being used again, and the US is run by the Mafia. Etc. 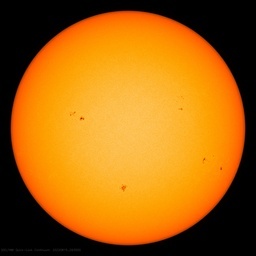 According to http://www.solarcycle24.com, there was another VERY small sunspot yesterday (3/4) that disappeared so quickly, it didn’t even get a number. This cycle is just sputtering…. On the SOHO image of today, March 6, at 08:00 UT I notice at extreme right a very small sunspot. It is situated in a small lighter region of the sun’s surface. Being close to the sun’s equator, that small spot again belongs to sunspot cycle No.23. Maybe it is again a short-living spot. Anyway, being close to the sun’s western limb, it will soon disappear behind the limb. The other day I was reminded about what I learned in geology decades ago – for the last several hundred thousand years ice over a mile thick was typical for North America and Northern Europe. Short interglacial periods dotted that period, with periods of about 10,000 years of warmth be typical in the last 100,000 years. Our last Ice Age ended about 11 thousand years ago and so we are about 1000 years over due. The Mini Ice Age we saw several hundred years ago would be typical for the beginning phase of a new Ice Age. Obviously the sun has been going through long dim cycles for the last several hundred thousand years. Yet NASA and modern Science (perhaps in an effort to protect Wall Street and prevent panic in the streets) is trying very hard to pretend like this interglacial period will go on forever. Actually the only thing that MIGHT save us is a larger carbon footprint.